It’s not often that I crank out straight-up chocolate ice cream, so it took Katrina’s pick of Chocolate Ganache Ice Cream to make me remember how insanely good it really is. After letting it temper a bit, you need nothing but a cone or a spoon to enjoy it in its purest form. But you can also turn it into wicked treats, like sundaes topped with marshie fluff and salty peanuts, or boozy bourbon milkshakes. For the recipe, see Baking: From My Home to Yours by Dorie Greenspan, or read Baking and Boys. Don’t forget to check out the TWD Blogroll! Wow that sounds insanly good and indulgant. SO smooth and creamy looking. Yum! Impressive! Your photo says it all. Your ice cream looks delicious! You know, looking at your picture just made me realise I bought those exact same cones especially for this ice-cream. I forgot all about them! This was a hit as well. I enjoyed one serving pure and unadultered and then went back for a s’mores version. Both delicious! In this instance.. chocolate ice cream in its purest form is so good! The bottom is the best part of cake cones. I once watched with astonishment as a guy ate a cone all the way down the last most prized bite, and then gave that bite to his dog! ^I’m with Valerie – swoon!!! Boozy bourbon milkshakes – yes please! This looks great in its cone! Looks fantastic. And those ideas for other things u can do with the ice cream sound great too. All things chocolatey gets my vote and this is no exception!!! 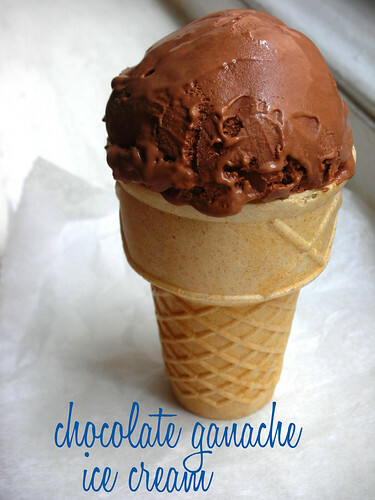 Love your creamy and rich chocolate ganache cone! You just had to give a handfull of options for adding with this ice cream; now I want to make bourbon milkshakes for dessert tonight. Hubby would be happy =)! O wow, that looks AMAZING! Hmmm, boozy bourbon milkshakes…yum! Love the pic with the cone. Now I’m wishing I’d had some cones on hand for mine!! I agree, love the criss-cross part at the bottom. I really need to get an ice cream maker! ooohhh!!! boozy milk shakes. what a great idea. I agree, this ice cream was just perfect. Love how your looks in that cone. So decadent and rich! Thanks for churning along with me this week. A boozy milkshake…that sounds good. Beautiful! I’ve been looking for one that was super rich and dark and creamy looking. a cone… a cone…. how PERFECT! Never thought of that – but it’s fantastic – truly! What a nice looking scoop – and glad you enjoyed it, I thought it was one of the best chocolate ice creams!